Clearwater is an awesome city to visit, but even more than that, it’s an incredible place to live. Clearwater beach is one of the best beaches in all of Florida and the city and suburbs themselves are perfect for all ages. Don’t believe me? Look it up. Clearwater Beach has been named one of America’s Best Beaches year after year. There are tons of nice cities with great beaches in Pinellas County, but none of them are quite like Clearwater! Even though Clearwater is the smallest of the three major cities that make up the Tampa Bay Area it still has over 100 thousand residents (that doesn’t seem small to me). All of which have access to Florida’s Favorite Junk Removal Company, The Stand Up Guys! Just use the Stand Up Guys one time and you will quickly see why we have been tagged with that awesome title. 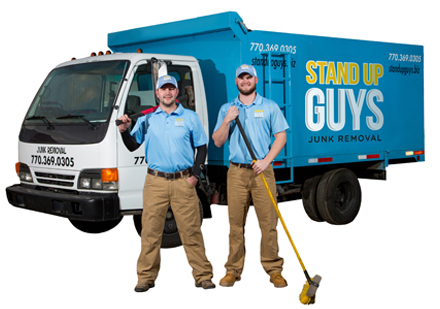 The Stand Up Guys Junk Removal Crew covers all of Clearwater and Pinellas County. We offer a wonderful service and an affordable cost to Clearwater. If you are looking to get rid of any junk, debris, appliances, furniture or anything else, then The Stand Up Guys Junk Removal Crew is perfect for you. Hiring The Stand Up Guys to take care of all your junk removal and hauling needs in the Clearwater Area is the smartest decision you could make when it comes to your clutter. We take care of all the hard work so that you don’t have to. That includes all the heavy lifting and loading and hauling everything away. It’s that easy. At Stand Up Guys we give back to the community as much as we can as well. We filter through and separate all the items to insure that we can donate and/or recycle as much as possible. This is one of the main reasons why we are able to recycle and donate over 60% of the items that we remove. This way you know that your junk will find a good home rather than just being tossed in the landfill. For all your junk removal and clean up needs, Clearwater can count on the Stand Up Guys! The Stand Up Guys Junk Removal Crew cover all of Clearwater and the surrounding areas from our Headquarters at 4592 Glenbrook Circle, Palm Harbor, Florida 34683.